Hi guys, it is Teresa from Fun in K/1 and Teaching Blog Roundup is my baby! I am sure everyone is aware of the Google Reader closing up shop July 1st. You might be wondering how will I follow my favorite blogs? Or even how will people follow me now? Bloglovin' is the answer! One of our fabulous authors, Brenda at You Might be a First Grader, has a great post explaining Bloglovin' a little more. She actually turned me on to it and I'm lovin' it! I downloaded the app on my iPad and it makes blog stalking so much easier. I have also added to my blog, Fun in K/1, and have added a few new followers because of it. So make sure you keep up with all of the fabulous things happening here at Teaching Blog Roundup! Speaking of keeping up with all of the fabulous things going on at Teaching Blog Roundup, make sure you are following us on our shared Teaching Blog Roundup Pinterest Board and Facebook. All of our amazing authors post once a month. Their posts are more than just a quick freebie, they are informational. Another benefit of keeping up with the TBR blog is seeing what our authors are up to on their individual blogs. I did manage to finish one little thing on my summer to do list. Next year, I plan to do a Lego or building bricks theme in my classroom. I am sooooo excited. 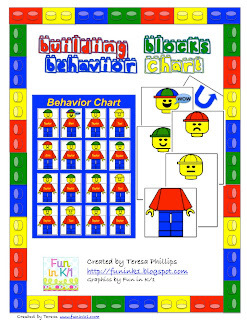 I made this set to use for my behavior chart. You can get it here in my TpT store. I have tried many things over the past, but have found the "green, yellow, red" or "happy, straight, sad" works very well for me and my students. I have added two little twists. The first is a WOW card. Each student starts the day on "happy face" and if they go above and beyond they can earn a WOW card. I also use a "U-turn" card. Once a child moves to yellow or red, I don't let them move back up. I do this mainly because as a parent, I want to know if my child is not behaving at school. However, I don't want the students to just give up for the day either. (My youngest daughter would totally do this!) So if they turn their behavior around during the day, they can earn a U-turn. I note this in their planner by making a note of the straight or sad face and the behavior that led to this. I also draw a U-turn to let the parents know that their child turned their behavior around. I hope you are all having a sensational summer and fabulous Friday! Thanks for the shout-out and I love the Lego idea. I have had some kiddos that would go crazy for that.